I am reproducing below the text of a press release received this morning from The Natural Resources Defense Council and Forest Ethics. It seems to me to be written for the US market, but no doubt there will also be a version seen on Canadian media. The Press Release contains a link to the NRDC web page and from there to 21 page PDF report with 216 citations. This illustrates what they are concerned about. I did not draw this map of course. I would have included the BC/Alaska border, the Chevron refinery in Burnaby and labelled the TransMountain pipeline as a proposed expansion. SACRAMENTO (April 28, 2015) – The Pacific coast faces a looming health, climate, and environmental crisis posed by an influx of tar sands fuel from oil interests in Alberta, Canada, according to new analysis released today by the Natural Resources Defense Council (NRDC), NextGen Climate America, ForestEthics, and a coalition of 27 partner organizations. The tar sands industry’s long term goal to triple production will require flooding both Gulf and West Coast heavy crude refineries with tar sands crude in coming decades. The increased transport of tar sands by rail, pipeline, barge, and ocean tankers will threaten the water and air quality of hundreds of communities, heighten the risk of tar sands oil spills and explosions, and reverse decades of public health, energy, and climate successes from California to British Columbia. 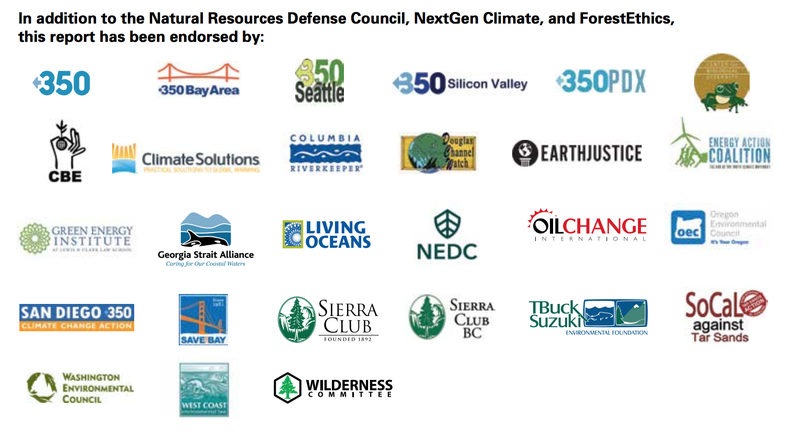 The report also finds the proposed tar sands expansion puts iconic places such as Washington’s San Juan Islands, the Columbia River Gorge, Oregon’s Willamette Valley, the Sacramento Watershed, and the San Francisco Bay at risk to spills and accidents. Tar sands spills have proven to be more damaging than conventional spills, as heavy tar sands bitumen sinks below the water surface making it even more difficult to contain or recover should a spill occur in one of the hundreds of rivers, streams and critical watersheds across the West Coast vulnerable to expanded tar sands pipeline and rail traffic. A spill could devastate local economies, harm human health, kill critical species, damage First Nation territories, devastate pristine wilderness, and lead to an especially costly and challenging cleanup. The study had clear recommendations for decision-makers: States should aggressively pursue clean energy strategies that discourage dirty fuels like tar sands while decreasing the region’s dependence on oil, including policies that spur low carbon transportation and energy solutions such as broadened electric vehicle use and the development of clean fuels. Additionally, decision-makers must reject new major tar sands infrastructure projects and ensure all proposed fossil fuel infrastructure go through a thorough public health and environmental review process. State and federal regulators should enact safety, spill response, and air pollution standards that ensure the risk of a tar sands spills is eliminated, the public is safeguarded from derailments, and communities are protected from toxic refinery emissions. I misinterpreted the headline: by “tar sands invasion” I thought it meant the allegorical “invasion” of laid-off tar sands workers coming to, some returning to, BC in search of jobs. Anecdotally, I spotted a promotional deal for a hot water heater —it was such a good deal, I thought it had to be promotional—which I happened to need. I’ve been out of the picture for a couple of years, last time involved in construction, during which there was a housing boom in the Comox Valley, and one could scarcely find electricians and plumbers, all of them swamped with work. But, as the water tank guy explained when he arrived punctually for the installation, work has been getting hard to come by these days (hence his promotional offer) because so many fitters were returning to the Valley desperately looking for earnings with which to cover big mortgages and truck payments in Fort Mac—some living, as the tank guy elaborated, in their parents’ basements and taking any job they can get, and for greatly reduced rates (cash under the table). I heard this comment a few times more from friends and acquaintances around the Valley. It makes sense that these laid-off workers would be desperate to cover big debts: they assumed them when they were making big money and they incorrectly presumed the gravy would never stop. Who could have predicted the tar sand’s demise? I mention this to hopefully illuminate another aspect of the tar sands phenomenon, one experienced by laid-off workers, and by legitimate (ie., registered, taxpaying companies with above-board payrolls) enterprises who are getting bumped by refugees from Albetar. Doubtlessly some of these will be voting in their BC refuges—although it’s prejudicial to stereotype them as tar sand supporters of Stephen Harper’s Conservatives. I always figured half the problem with the tar sands is the head-off rate of development, ignoring every criticism—except maybe on ducks— polluting downstream communities and air around the globe. Slowing it down—by way of market forces—has its own negative effect too. In each case, shortsightedness is featured, and in no case is the resource husbanded for future use when, hopefully, it will be used in a safe way. The profiteering model isn’t working for anybody, not even tar sands proponents. That may explain something I heard yesterday. Our condo needs some work done and put out an RFP. The response was far greater than anticipated. I had expected that with all the new build going on all around us that contractors would be hard to find. Not so, apparently. More addenda: there is a refinery in Prince George and the ‘proposed’ rail line was built before the 1st World War. There are two potentially major influences on the flow of oil out of Alberta. One is the unheard of surge of support for the NDP only five days before the election. They have the majority of the popular vote very late in the campaign, but of course that won’t likely hold in the number of seats because their support is concentrated mostly in Edmonton seats. However, they are neck and neck and neck with the two right wing parties in Calgary and one cannot discount the possibility that they could benefit from vote splitting there. The pragmatists are saying there could be a minority government with the NDP holding the balance of power for the first time in living memory in that province. There is an outside chance that they could form a majority government. Having lived there during my youth, I find that absolutely astounding. According to their platform the NDP will push for greater value-added benefits (translation: more refining activity at home, less export of raw resources, diversification of energy into more wind, etc.) and higher royalties. Currently, oil companies pay only about 2% on the export of diluted bitumen from the tar sands. It’s the classic Canadian Way: export jobs without giving a fig about the environmental externalities and economic consequences. Alberta has been allowed to get away with that through political donations to pliable parties who write compliable laws, mostly the PCs. To refine the bitumen at home means creating thousands of jobs in upgrading the tar first into synthetic crude, and thousands more again in new refineries to make finished products (gasoline, diesel, etc.). The royalties charged on refined products is about 25%. I don’t see any government shutting down the tar sands, not even the NDP. But this party is far, far less beholden to Big Oil than the others and could very well slow down the flow while creating more jobs, diversifying into value-added components, and earning higher royalties, perhaps enough to take a breath and fund more public transit and develop green energy alternatives to their coal-fired power, and start decreasing Alberta’s massive carbon footprint. In my view there is a very significant possibility that Enbridge Northern Gateway will officially die and Kinder Morgan Trans Mountain will be reduced in scope with the NDP acting as a major influence on Alberta politics, at least for a couple of political cycles if they prove they can lead. Either way this will result in fewer than planned tankers on our coast. The other influence would be the world price of oil. It’s now creeping back up toward the tar sands break even point, but the economy is quite tenuous and susceptible to reacting to price instability. There is a floor and a ceiling in prices that relate directly to the flow, and I suggest they are about $80 and $150 a barrel respectively. The fact that cheap conventional oil production has already peaked, and the US shale production is about to peak after the current slump ends, means that a shaky economy will continue as the prices continue their roller coaster track. Why Big Oil and the governments they influence haven’t started to deal with this (i.e. to diversify) and develop policy coupled with limiting emissions boggles the mind. The Alberta election is now over. With an NDP majority government, it was one for the history books. A 10.0 political earthquake that will resonate across the country. 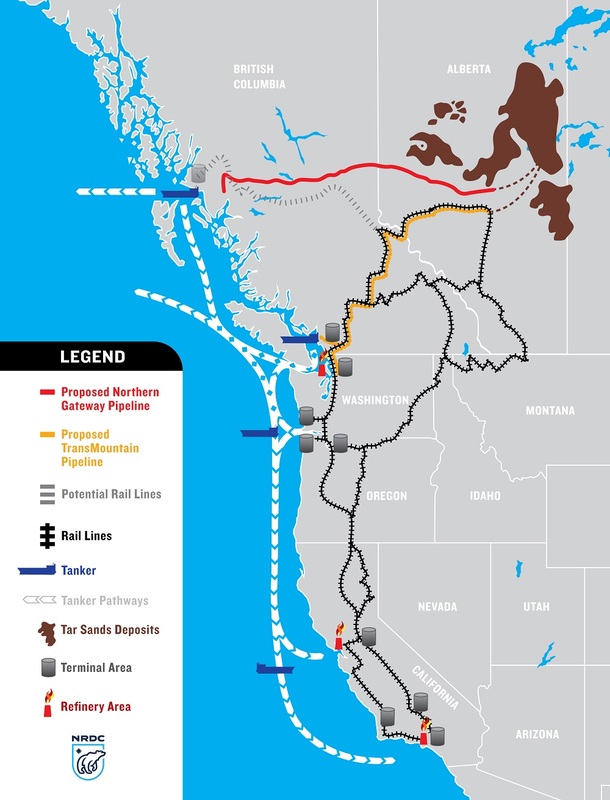 I believe the Enbridge Northern gateway project can be erased from the map above, as the new NDP premier of Alberta is on record as not supporting it or Keystone. That, and the nearly insurmountable challenges (aboriginal, environmental, geographical, navigational, legal), tips the balance I believe toward Rejection, with a capital R. It’s now time to resolve the land claims once and for all, and to make the Great Bear Rainforest into a national park in perpetuity. Rachel Notley ran on an economic diversification platform, and now there is the possibility that transporting raw bitumen (well, slightly diluted) west to Asian refineries at a royalty rate of only 2% will be increasingly resisted from the highest office in the Alberta government in favour of refining it at home and transporting finished products to eastern Canada at a 25% royalty rate. Big Oil CEOs do not own the NDP as they did successive conservative governments, so it matters not a lot what they think about that. There is the possibility that these factors will result in less oil being moved with more economic benefits to society and revenue for government, considering all the multipliers. This is all theoretical as it will take at least two more election cycles to build upgraders and refineries. If it works out, then they will have the revenue to shut down their coal power plants, fund renewable power and build public transit, all of which will help reduce Alberta’s monstrous carbon footprint. Shutting down the tar sands is not on any politician’s playlist, but three things will certainly affect production: (1) the world price of oil, either too high or too low and a decrease in production will result with some operations closing; (2) carbon pricing, which is a subset of (1) with the exception that Alberta itself may now institute it in cooperation with other provinces, whether that’s cap and trade or preferably a simple carbon tax remains to be seen; and (3) decreased consumer demand from the implementation of conservation measures, decentralized renewables (e.g. rooftop solar), urban transit with appropriate zoning measures, and regional and national electrified transportation with a trans-Canadian smart grid. The election of the Alberta NDP is a true game changer. Personally I’m trying to be cautious in outlook over the NDP victory in Alberta, but I can’t help thinking that the Federal election will occur during a timeframe where Notley’s government should still be enjoying a honeymoon with the electorate.